Heavy Series Roller Chains are manufactured to ANSI B29.1 Standards but feature thicker side plates. Having thicker side plates not only drastically increases the strength and fatigue resistance of a roller chain, but it also reduces stretching and wear that happens over time. Heavy-duty roller chains are optimal to use in agricultural applications, skid steers, heavy equipment, and any application that you are looking to increase the strength of the chain without having to go up a size. 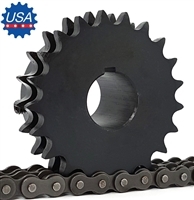 USA Roller Chain and Sprockets has the widest selection of heavy chains, standardly we stock simplex, duplex, triplex, double pitch, and even cottered heavy roller chain. However, if you don't see what you need custom heavy duty roller chains can be manufactured upon request. When it comes to accessories for heavy-duty drive chain, the rollers must be of high quality. Find superior usage and durability in solid rollers from USA Roller Chain. As the roller is the primary point of contact between the chain and sprocket, you need a solid assembly in every product. Shape deformation is the first complaint when it comes to split rollers, and you’ll even see more wear on your system. Over long periods of time, solid bushings stop most internal friction from occurring. By retaining their form, solid rollers are perfect for medium- to high-speed applications. Take pride in Economy Plus heavy-duty roller chain because solid rollers are the norm. Use them in light- to moderate-duty applications. Their high-tensile strength and compliance with ANSI B29.1 standards make them a standout. When you're looking for value in your 80 heavy-duty roller chain, look no further than the General Duty Plus heavy-duty roller chain models. High-precision components are required in these chains, which offer extended performance times and solid rollers in moderate- to heavy-duty applications. Look for solid bushings in select sizes as well. Every General Duty Plus heavy-duty 50 roller chain comes with ample lubricant to serve your needs each day. Don't compromise on any part of your machinery setup. Pick a top-tier model in our Premier Series heavy-duty roller chains. Appreciate the shot-peened manufacturing on each component. This detail also extends to heat treatments across the metal. Hardness and elongation resistance is possible in these heavy-duty roller chain specifications. USA Roller Chain knows that the manufacturer also pre-stretches the assemblies so that there are no surprises in the field. Top performance, impeccable strength and extended working lives define the Premiere series of roller chains. Besides roller chain, we can also supply sprockets. When using a sprocket that has less than 30 teeth for heavy roller chain, it is recommended that the sprocket has hardened teeth. 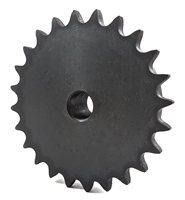 All of the sprockets we supply with 30 teeth or less come with hardened teeth as a standard. Single strand heavy duty roller chain is compatible with standard sprockets. We keep a full line of ANSI sprockets in stock in a wide range of variations, including taper bushed and QD style. Multi-strand heavy duty roller chain sprockets and standard multi-strand roller chain sprockets are not interchangeable. The reasoning is being that the thicker side plates on the chain will not allow for the roller chain to seat and engage properly with a standard double sprocket. We can supply specially manufactured sprockets for this chain but it will require a 1 - 3 week manufacturing lead time.